In A.D. 911, when the people of Constantinople were threatened by invaders, they fled to the Church of Blachernae and implored the aid of the Mother of God. During the All-Night Vigil, one of those there, Andrew saw a vision of the Mother of God approaching the center of the church. She knelt down and prayed tearfully for a long time. Andrew said to his disciple Ephiphanius, “Do you see our Lady, the Queen of the World?” Ephiphanius replied, “I see her, my spiritual father.” After the Mother of God finished her prayers, she took off the shining veil, which enveloped her, and extended it over the people in the church. 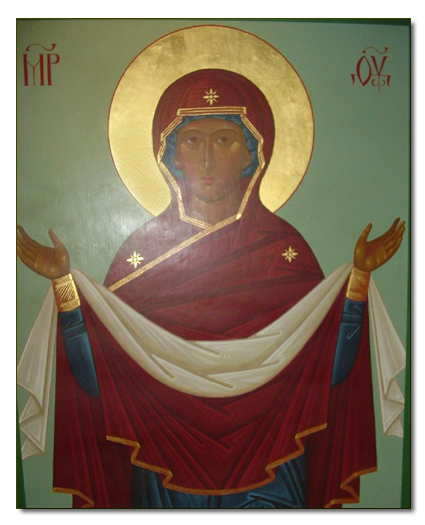 Though only Andrew and Epiphanius saw the vision of the Mother of God and her veil, all who were present felt the grace of her protection. More honorable than the Cherubim, and more glorious beyond compare than the Seraphim: as a virgin you gave birth to God the Word. True Mother of God we magnify you. Christian artists have depicted the Holy Trinity in a variety of ways. Early artists never depicted God the Father in human form, but as the Dextera Domini, the Hand of God. In the 9th-century apse of St. Mark’s, Venice, Christ stands below the Hand of God and above a dove. In the 16th century, God the Father, depicted as the Ancient of Days – a bearded old man in white garments – sat on a throne, with Christ the Word on his lap, and Christ holding a halo containing a dove. In the Orthodox Church, the visit of the three men to Abraham is interpreted as a revelation of the Holy Trinity. Abraham and Sarah offered food and drink to the visitors who, in turn, promised the aged couple that the barren Sarah would bear a son. In Andrei Rublev’s 15th-century icon, from which the icon before you is copied, the three angelic figures represent the three Divine Persons of the Trinity. The table has become an altar, and the meal has become the eucharistic chalice with the head of a sacrificial animal. In the background, Abraham’s tent is represented by a temple – the House of God. The Oak of Mamre is now the Tree of Life planted by God in Paradise. From it, according to Tradition, came the wood of the Cross. The mountain signifies spiritual ascent. Which Divine Person is represented by which angelic figure? There are different interpretations. The interpretation that I understand is that the figures represent, from left to right, God the Father, God the Son, and God the Holy Spirit. The Son and the Holy Spirit are bowing their heads toward the Father, Who is the Source of both. The Son points with two fingers to the chalice, indicating his mission to become the sacrificial lamb, human and divine, through the Incarnation. The Father gives the Son a gesture of blessing. The Holy Spirit points to the rectangle in the front of the altar, the rectangle symbolizing the world. This signifies that the divine sacrifice is a sacrifice for the salvation of the world. 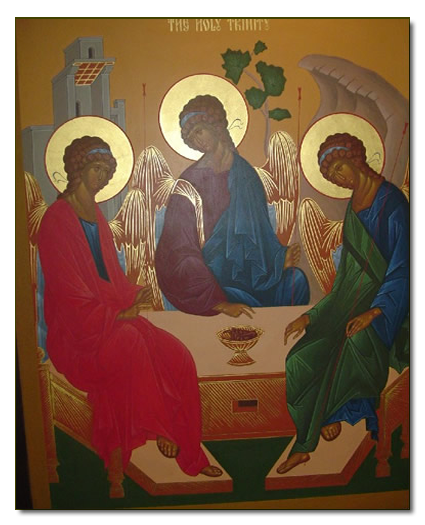 This icon perfectly represents the One Essence of the three Persons of the Trinity. Installed in Our Lady of Lourdes Church on January 19, 1997. Stolen April 4, 1998 ( on the 30th anniversary of King’s assassination). Found in Lake Merritt on Holy Saturday, April 11, 1998. Dr. Martin Luther King, Jr. (1929-1968) Dr. King’s philosophy of nonviolence was strongly influenced by Mohandas Gandhi, the Hindu Nationalist leader of India. King expressed this philosophy in the language of Christianity. He was ordained a Baptist minister in 1947. He led nonviolent demonstrations and marches throughout the South. He was jailed, attacked, and his house was bombed. 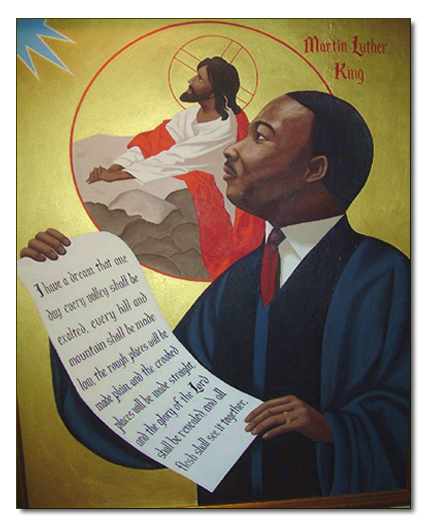 Dr. King was martyred on April 4, 1968, in Memphis, Tennessee. 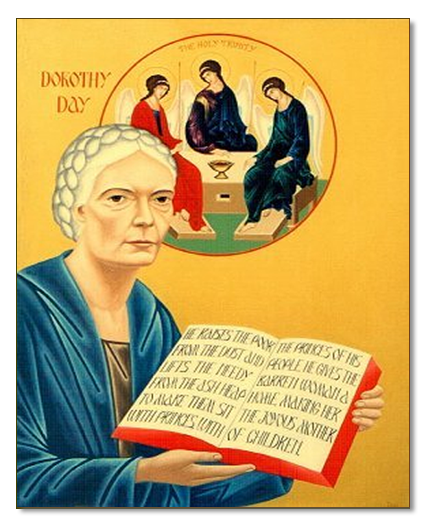 Dorothy Day co-founded the Catholic Worker movement, a movement which began in 1933 as a small “penny-a-copy” newspaper devoted to promoting issues of social justice and peace in the Catholic Church. (The Catholic Worker is still a penny a copy.) The “Catholic Workers” also began serving meals to the poor, and established houses of hospitality for the homeless. Today there are about 130 Catholic Worker farms and houses of hospitality across the United States and throughout the world. Dorothy’s conversion to Catholicism changed her life, and it stuck with her for the rest of her life, even through the most trying times. She shared the joy of her conversion with those around her, especially the poor. When she helped the poor, she was helping Christ. For Dorothy Day, peace and justice were inseparable from her Catholic faith. The Holy Trinity Icon was one of Dorothy’s favorite icons. Early Christians believed that the three men who appeared to Abraham at the Oak of Mamre (Genesis 18) were manifestations of the three Persons of the Trinity: God the Father, God the Son, and God the Holy Spirit. This Russian Orthodox icon emphasizes the single nature of the three Divine Persons, that they are equally significant. In the Greek Orthodox Church, this icon is called “The Hospitality of Abraham”, referring to the hospitality which Abraham and Sarah gave to the three men. Hospitality was a theme of Dorothy Day’s life, a life which recalls the verse from Hebrews: “Do not neglect to show hospitality to strangers, for thereby some have entertained angels unawares.” Psalm 113. Dorothy quoted from this psalm at the end of her autobiography, The Long Loneliness. “I found myself, a barren woman, the joyful mother of children”. The verse refers to much more than the joy she received from her daughter and grandchildren. Her family was also the community of poor and homeless people, many of whom were drug addicts, alcoholics, and prostitutes; the people no one else wanted to help. Her barrenness was the emptiness she felt when she was separated from her sense of community, separated from her faith. Note from the artist, despite Dorothy Day’s probabable objections, there is a movement in the Church promoting her cause for canonization. If she is canonized, I have allowed room above her name for the word “Saint”.